A simple lattice, a limited palette of colors, and a nudge of its own movement let the words of I, You, We resonate. The piece is visually pleasing and also quite readable: choose a word and a direction and start going. 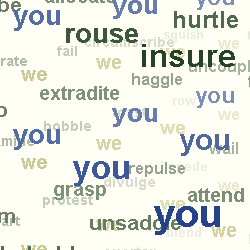 Waber and Pimble's verbs are six-dimensional, plotted on the X, Y, and Z axes, but also on the axes of I, You, and We. Author description: The viewer is inside a kind of cube, an infinite cube that can be rotated endlessly without returning to the same view. Between I and you and we flows a river of verbs. The piece can be manipulated by clicking or dragging, or will move on its own if left still for a few moments. Instructions: To see more of I, You, We, click and drag the text. Previous publication: I, You, We was exhibited at Harvard University's Dudley House in Spring 2005 as part of the Infinity exhibit. Infinity: an exhibition of visual poetry and artwork built on/from/around words and letters is also available online, http://www.infinitypoetry.com/.